Heat oven to 375°F. Spray 2-quart round baking dish with cooking spray. Cook and drain pasta as directed on box. Meanwhile, in 12-inch skillet, melt butter over medium heat. Add onion; cook and stir over medium-high heat about 5 minutes or until soft and beginning to brown. Stir in thawed squash, chicken broth, thyme and salt. Cook and stir 3 to 5 minutes or until slightly thickened. Stir in 1/2 cup of the cheese. 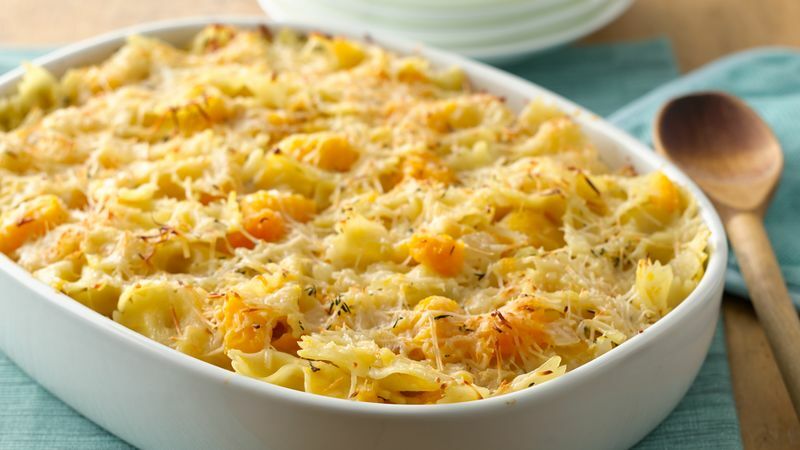 In large bowl, toss pasta with squash mixture. Spoon into baking dish; sprinkle with remaining 1/2 cup Parmesan cheese. Bake uncovered 10 to 15 minutes or until hot and cheese begins to brown. Using frozen winter squash is an easy way to add flavor and nutrients to this creamy bow-tie pasta dish.